Ru ware got it’s name from the Ruzhou territory, Henan Yu Chau, Baofeng area. 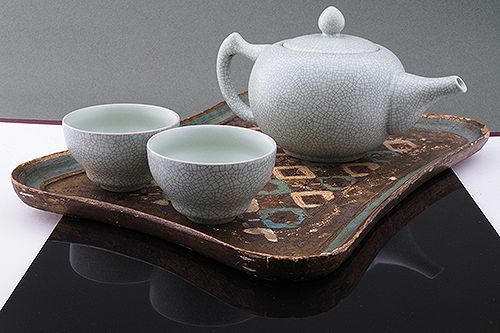 Ru ware made up some of the most treasured pieces of the royal house. It came in hues ranging from Celeste blue, Pearl White and Jade Green. The colour was created by adding small amount of iron oxide to the glaze. The surface was covered in tiny cracks through which glimpses of the brown clay below could be seen. This effect was called “crazing” which is achieved by cooling the glaze quickly causing it to crack away from the clay beneath. Ru ware was only produced for a period of approximately twenty years. And today it’s estimated there are only sixty seven pieces that survive. In 2012 one piece set a record at auction selling for a whopping HK$ 207,860,000 that’s over £20 million! War ended the production and the art of Ru Yao was lost to history until 900 years later. In 1983 the Chinese government commissioned hundreds experts to rediscover the lost secrets of the Ru Yao technique. It took them ten years to master the art but today everyone can enjoy what was once only meant for emperors.